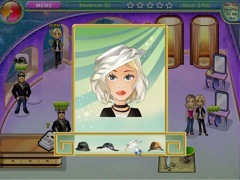 Join Alicia for fast fun in Posh Boutique 2! Join Alicia for more fast fun in Posh Boutique 2, the sequel to the hit time management game that's been called, "the type of game you simply can't afford to leave lying there on the rack." After taking over her grandmother's line of fancy clothing stores, Alicia decides it's time for some rest and relaxation. But, just as her vacation gets off the ground, Alicia suddenly discovers she's won the lottery! Now, with her winnings in hand, Alicia's ready to take her Posh Boutique to the next level. Help Alicia expand her business beyond her dreams by assisting each customer in their search for the perfect outfit, adding just the right accessories, and choosing the best upgrades and enhancements for each location. Players all over the world loved watching Alicia take her first steps in the fast-paced world of retail in Posh Boutique. Guide her through the next chapter by playing all-new mini-games, decorating store windows, solving challenging hidden object levels, and much, much more. Try the free demo version on for size, or download the full unlimited version and you'll see that for original fashion fun, Posh Boutique 2 is a perfect fit!